People seek happiness, peace and love in every activity. This quest takes us outside ourselves as we look for answers in relationships, events and achievements. Unfulfilled expectations and unexpected happenings, in turn, create regrets about the past and anxieties about the future. And so we ignore the perfection of the Present, that simple and profound state in which you are love, you are peace and you are the happiness you seek. 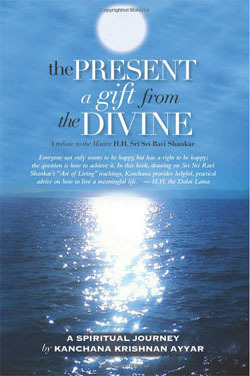 “The Present “A Gift from the Divine,” is a book about making the decision to be happy now, in the present moment. It examines the impediments on the Path and explains various methods to access ‘present moment awareness’ through a symbiosis of knowledge and of breathing and meditation techniques. The book celebrates the transformation in the lives of thousands worldwide through the practice of “Sudarshan Kriya,” breathing techniques formulated by spiritual leader and humanitarian, H.H. Sri Sri Ravi Shankar, the founder of the Art of Living Foundation.